TRAINING EVERY TUESDAY & THURSDAY NIGHT! Training for the 2015-16 season has begun! Join us for practice at the British School of Houston at 7pm every Tuesday & Thursday. No experience necessary. Our first training of the year had a great turnout and a lot of new faces! Pictured below are some of the 57 players who came out to practice. It’s an exciting year for HURT. Come be a part of it! Please join our FACEBOOK page for the most up to date information. 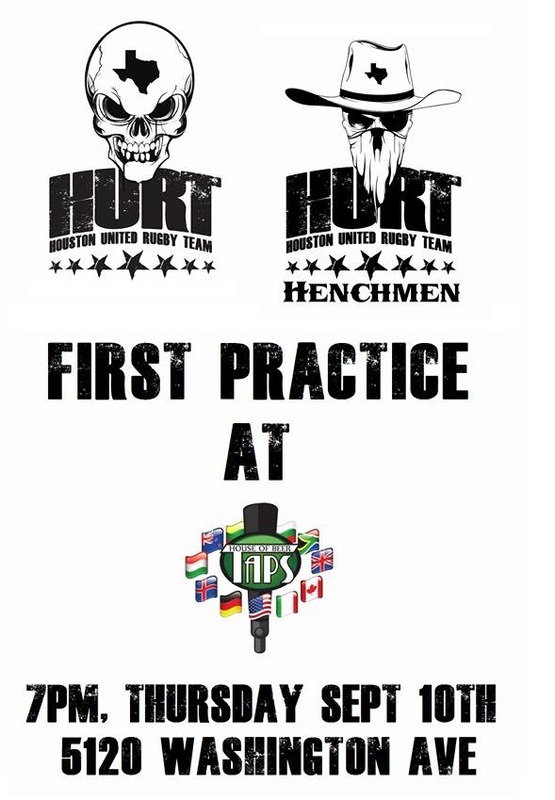 The Houston United Rugby Team will hold the “first practice” in their new home: Taps House of Beer. The event begins at 7pm on Thursday, September 10th. All are welcome to attend. This is a great opportunity for new prospective players to meet and greet HURT coaches and players. Contact Dan Green for additional details @ 713-518-6525.